A Typical Italian Breakfast "Wake up Call "
How about a typical italian breakfast together for a cold sunday of January? Come and join us in this typical italian place called in italian " Bar " , in the heart of Rue de Rivoli in Paris. 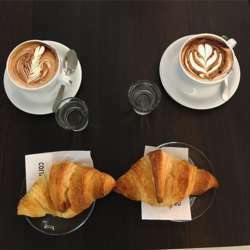 The purpose of this place is to promote the Italian Coffee and Cappuccino , everything is made in Turin, a famous town in the north of Italy, and it's made in a famous coffee firm called "caffè Costadoro". So all the products are ORIGINALLY MADE IN ITALY..
From the region, Piemonte , where Turin is, they also propose hot chocolate, which is typical of the region.